I recently stumbled across the work of John Graunt, a London resident in the mid 17th century. 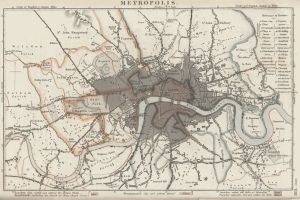 Graunt used London's Bills of Mortality to publish an insight into the causes and spread of the plague. Among other things, he was able to use the data to prove that plague was not spread by person-to-person contact, and peaks of plague were not related to the reign of a new king. He found that more boys were born than girls but that infant mortality equalised the ratio. Most importantly, he found that by analysing data you actually uncover knowledge. From humble beginnings as a haberdasher, he rose to the respect of King Charles II and was elected a member of the Royal Society. Graunt was a self-educated man, yet the statistical, epidemiological and demographic work evidenced in his Observations set him out as a pioneer. 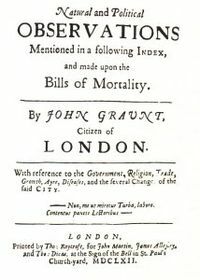 350 years ago, Graunt was doing what we might now call "public health intelligence". Graunt calculated that 36% of children didn't reach the age 6 (a startling figure by today's standards). With further categorisation and analysis, he deduced that people were dying of causes unrelated to age - preventable diseases. Graunt's work helped to encourage medical practitioners of the day from merely treating symptoms to investigating preventative measures. There are strong similarities with the evolution of business intelligence techniques (from reporting on history, to predicting the future, to influencing the future). Despite Graunt's successes with the analysis of the data, routine collection and analysis of health data didn't start until 200 years later (William Farr was appointed as the 1st compiler of scientific abstracts). Nonetheless, we should acknowledge his achievements and his pioneering of "analytics".